One of the best things about being a sommelier is that you are never lacking for dinner companions. My friends often invite me over for a meal with the expectation that I will bring a wine to suit the occasion and cuisine. I consider this the best of all possible worlds: I get fed for free AND show off?? Sign me up! I wanted to recount a few of these recent get togethers in order to demonstrate 3 favorite principles of food and wine pairing. One such pairing pal is my friend Rach, proprietress of the Gluten Free Table. We actually went to high school together and reconnected when I started working at HubSpot. She also recently moved around the corner from me, decreasing my commute time and making the People's Republic of Cambridge that much cooler! 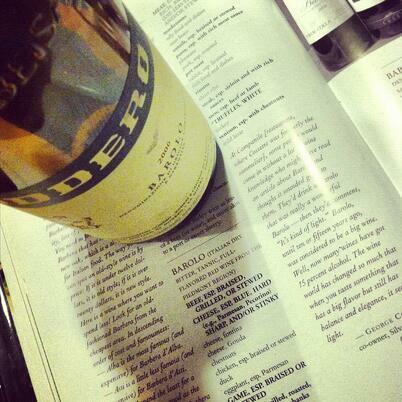 The impetus behind our first meetup, was the 2006 Oddero Barolo. I had been dying to crack it, but it is the kind of wine that cries out for food, with its high tannins and acidity. However, not just any food would do. We needed something hearty, robust, seasonally appropriate and alliterative: Bolognese! For those readers not familiar, Bolognese is a rich sauce hailing from Bologna in northern Italy. It is traditionally made with beef or pork, tomatoes, mirepoix (that's a dice of carrots, onions and celery to you and me), wine and cream. It also illustrates one of my favorite pairing principles for pairing food and wine: if it grows together it goes together. Traditional old world wines were traditionally made to complement the local food, so are you never going to wrong picking a Northern Italian wine to complement to a northern Italian dish. Just to confirm and given the fact that I wanted to impress my guest, I had to consult one my favorite books, "What to Drink with What you Eat." Barolo is best with any kind of meat or beef (preferably stewed), mushrooms, truffles and rich pungent cheeses. Love it when we are right! And Indeed the high toned acidity and astringent tannins were refreshing in conjunction with the rich and meaty sauce. The sweetness of the roasted tomatoes played beautifully with the sweet cherry fruit on the front of the palate. On our next meetup I had the opportunity to show my cooking chops, by recreating the best salad I have ever eaten at a restaurant: Fresh chopped + crispy kale, roasted butternut squash, ground almonds at Boston's Audubon Circle. If you have not been there yet, deprive yourself no longer. This gem makes me want to move to the Fenway every single time! I am proud to say that my recreation was spot on. My only opportunity to improve on the restaurant experience would be to bring my own glass pour. A hearty white would have been a great option, but I was craving a red, and something of contrast. My solution: Piazzo Piemonte Barbera. I am a big fan of the underdog, and Barbera definitely fits in with that theme, as it is one of the best grapes that you have never heard of. The wines always possess a brisk acidity, fresh red berry fruit, and chunky minerals. They also go with everything! I was worried about finding a wine to pair with the lemony dressing, but the squash, caramelized kale and parmesan provided the perfect contrast to this exuberant and pretty wine. It is a steal at $10 a bottle and pretty easy to find. And since all good things come in threes, we had our third meetup the other night. On the agenda, ravioli with hearty vegetable sauce (almost like a ratatouille) and a showcase showdown in the wine department: Bonarda versus Rioja. Wine number 1: Martilde Bonarda 2010. Do not feel bad if you have never heard of Bonarda - it's a super obscure grape from Oltrepo Pavese in Italy's Emilia Romagna. This region is known as Italy's bread basket, rather than for its wine. The result is that there can be some tremendous steals like this one: Aromas of black cherries, red plums, black pepper, maple bacon, and granitic minerals. On the palate, the tannins are velvety and a beautiful contrast to the acidity, which is biting yet fleshy on mid palate, which leads into a polished finish. In hindsight, we ought to have started with wine number2: Telmo Rodriquez LZ Rioja, as it is more delicate and dry than the Bonarda. The bright side of breaking the rules of sequential tasting is that we discovered more savory components than we would have otherwise. On the heels of the luscious fruit from the Bonarda, the Rioja offered more savory characteristics and red fruit: cherries, currants, cranberries, jamon (a silky, salty Spanish dry-cured ham), pesto, parmesan and slate. The pairing winner? Rioja FTW! Why? It is a perfect example of the pairing principle of like with like. The tang of the tomatoes matched beautifully with the bright fresh acidity of the wine. Yet there was also a savory component to the sauce which complemented the more savory elements in the wine. The herbs in the ravioli brought out the subtle herbaceous tones in the Rioja. Want to learn a little more about food and wine pairings? Check out this page. Have a pairing you want to run by me? Let me know here!